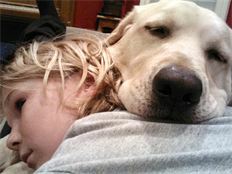 Emotional Support Dogs provide therapeutic, physiological and psychological benefits to individuals with special needs. These special needs can range from depressive disorders to Tourette syndrome; and include physical conditions such as, Lupus or Multiple Sclerosis. Emotional Support Dogs can also benefit older adults by providing affection, companionship, emotional comfort and support, and encouraging physical activity. Heeling Allies Emotional Support Dogs carefully selected and trained dogs that are steady, stable and well-mannered. These dogs possess strong obedience skills, have kind dispositions, and are good with adults, children and other animals. Relief from feelings of isolation. An increased sense of well-being. Daily structure and healthy habits. An increased sense of security. An increased sense of self-efficacy. An increased sense of self-esteem. An increased sense of purpose. Mood improvement, and increased optimism. A secure and uncomplicated relationship. A dependable and predictable love. Greater access to the world. Disabilities served include: developmental disorders, psychiatric conditions, and physical impairments. Our dog, Mori, has provided a sense of calmness and fun in my daughter’s life. We’ve brought Mori to my daughter’s counseling meetings and other locations, and he has turned out to be a perfect addition to our family. In fact, he has helped my younger daughter and me too.